It seems everything is going online. Once a collector of CDs and DVDs, I can’t remember the last time I actually bought an actual disc. But surely one of my great loves – going to a coffee shop – couldn’t go online, right? Well, to an extent it has. A number of roasters and companies are now offering home delivery via the internet for bags of freshly ground coffee. While you could always buy bags of coffee in the past, the subscription element is new and a little bit exciting. For those of you who have read my reviews know that I’m not all about the coffee. The café is bigger than a cup of coffee – it is the atmosphere, the food, the social interaction. These are elements that will never be replaced by coffee by delivery. However, I was very kindly sent a free sample pack by PerkULatte and figured that it might be worth exploring the ‘at home’ option. Not everyone has the free time or inclination to explore London’s back streets for a great coffee. As my home espresso maker, an ageing La Pavoni, is particularly fussy over which types of coffee it accepts (we’re down to just two brands) I decided to run PerkULatte’s freebie through my Aeropress. 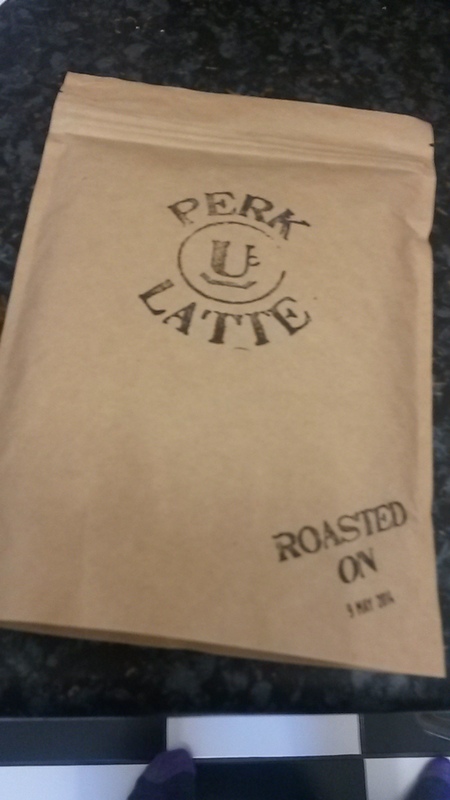 One of PerkULatte’s selling points over other subscription services is that it offers a variety of coffee, so you can change it up instead of sticking to one roaster/country/bean etc. The company also offers brewing guides on its website. They sent me the ‘El Salvador’. The beans are grown in the Finca Bosca Lya region, which is based at the foothills of a volcano in western El Salvador. They are wet processed at an altitude of 1650 metres above sea level. I used two good sized spoonfuls in the brew and allowed it to sit for over a minute before plunging. The grind was pretty course, which worried me a bit. As did the tasting notes, which promised honey, berries, jasmine, chocolate and caramel – but I have to say I was pleasantly surprised. While I didn’t really get any jasmine notes, the taste was very smooth and deep. Honey was the first thing to hit you – almost overwhelmingly so. I tasted the coffee both as espresso and Americano with milk. In its espresso form it was like drinking nectar. The honey caramel flavours really were excellent. As with most Aeropress brews, it didn’t have the acid or caffeine kick one has come to expect from machine espresso, but it was luxurious in its texture and flavour. When the extra water and splash of milk were added, the chocolate flavour moved further to the front but the honey was still the biggest taste. It also has a certain sweetness to it. All in all, it was a very good cup of coffee and one I’d happily try again. I’m not going to give it a rating as I’ve not tried enough home brews to develop a scale but I’d recommend this. Does it beats going to a café where a trained barista can get the best out of your bean? Of course not – but if you want a really good cup at home, then I’d recommend PerkULatte. Though I’d be happy to try and review any other home delivery services. The company offers three pricing packages from £9.99/month which gives you roughly 15 cups; £12.99/month for 25 cups; or £21.99/month for 50 cups. You can choose pre-ground or whole beans and delivery is free. Go to perkulatte.com for more details.